Each morning whenI walk past this little lake, I always stop and drink in the beauty. Sometimes I take my little Sony Cyber Shot point and shoot, and other times I take my DSLR Canon 1000D. I wonder if you can tell which shot is from which camera. 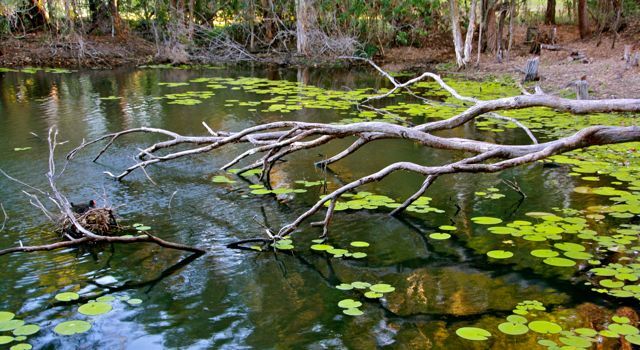 Dennis Lake, Daisy Hill, QLD. 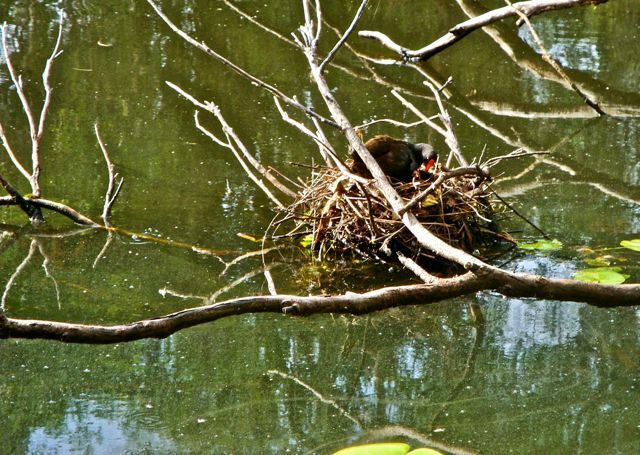 One morning I saw a Water Hen also called a Moor Hen sitting on her elaborate nest built in the branches of a fallen tree. I could see three little orange beaks peeping out from under her. The very caring male came and gave mother hen food to distribute to the three hungry mouths. Then he would busily swim off looking for more. Mother is telling her babies dad will be back soon with more. The Water Hen has other friends nearby. 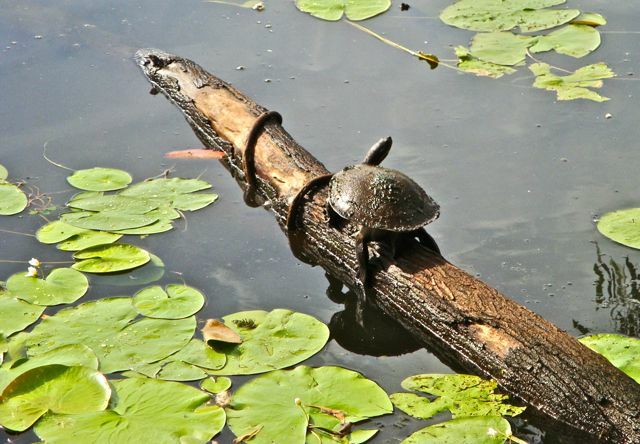 There were 8 seen sitting on this log one day. I love love these photos! How fun to get to watch the babies as well. I'll have heron photos up in the next few days from my kayaking last night. Stay tuned. I really don't think you can tell at a glance the difference between your cameras. The point and shoots are so good these days. 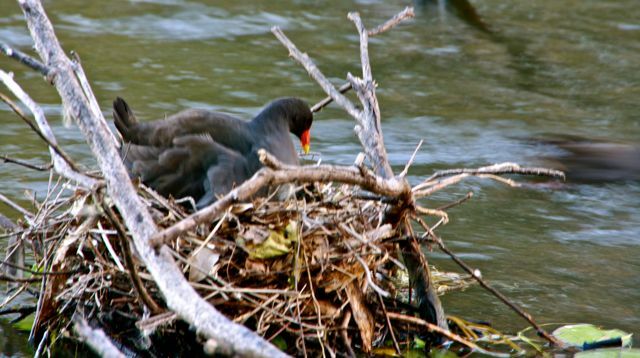 How fun to see the moorhen babies - and the cute little turtle. We don't have those here. Beautiful with the tree in the water. The turtle also seems to enjoy it. The duck yes but not the turtle. Number 2, 6 &7 are taken with DSLR. What a peaceful setting. All are great shots...I use two different Canon cameras too, and have found that the best shots are related to good light, not which camera I am using. Wonderful to see the little chicks with their Mum fussing over them ..... I would say that the second from top pic is a DSLR ... The others are hard to pick. It's great to keep our point and shoots ever at the ready for occasions such as this. Well done, the duck and the last shot of the Water Hen looking down at her chicks were also taken with the DSLR. What a lovely spot!! The 2nd last photo of the water hen is fantastic ... the water ripples have been frozen in time to perfection (I'm guessing the DSLR for that one?). They are all good photos, but the last two look like they were taken with a better camera. I hope those turtles don't eat chicks! Great photos. Very pretty lake. Such a beautiful spot and your photos take my breath. I love the turtle sunning himself. Hi Diane, I could spend hours around this lake. Just watching the birds and the critters. 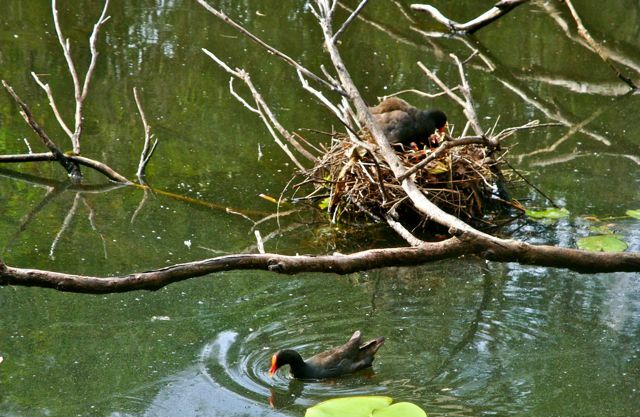 How cool to see the Moor hen with the babies. Very cute. All your photos are wonderful. But I am not sure which ones came from what camera. I will leave that to the experts. 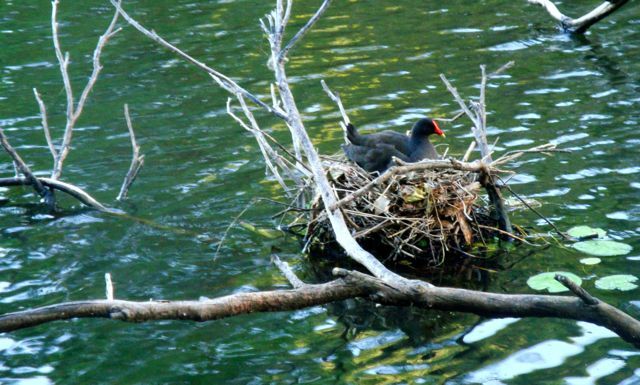 Hi Diane, Love your photos... Looks like our country right NOW... Love Spring... Love the Water Hen and her hubby/family... So neat!!!! My favorite pictures, even though I like them all, are the first two...Gorgeous!!! I've always been told that the most important ingredient for great pictures is the photographer and not the camera. Your pictures are wonderful, so it doesn't make much difference which camera you use. Well I don't care what type of camera you used. For all I care it could have been your old Brownie Box one of the 1950's. The photography is wonderful. 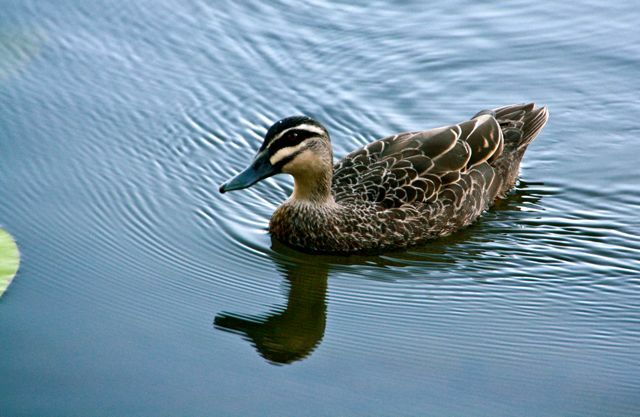 Water fowl if observed very carefully are the most dainty and delicate of water bird wild life. Last visit to Young, NSW, I must have arrived at hatching time. A creek runs through the township - in flooded times a raging torrent that splits the town in half, and all major roads in and out are no more. Mostly it is a series of stagnant water holes. Anyhow the chicks were all out with the mothers and fathers, ( does anyone know if water fowl mate for life, like cockatoes and galahs??? )Divorce courts would not be necessary with them. 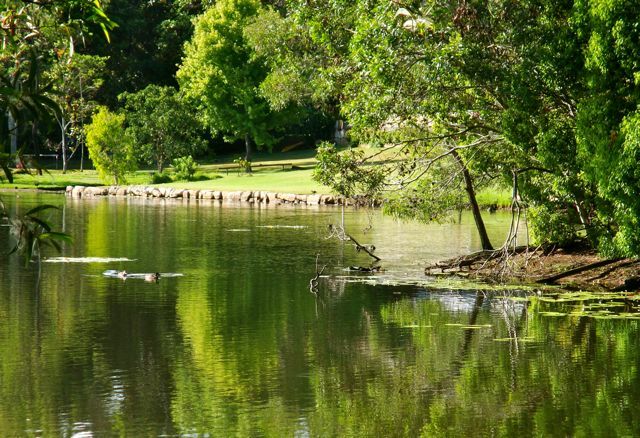 The local council keeps the areas onto this creek mowed and above are picnic grounds for visitors. To see the little families all parading was a sight to behold. Strange that the chicks obeyed their parents? Obedient. Ah well the wonders of the bird kingdom! what can i say? i love this stuff. whenever you are, is the coolest place, diane. shoot lots of good stuff for us! Oh how lovely...! isn't it amazing how couples, whatever species, can work in together. Like others I don't much care how or what camera was used for these photographs. You are lucky to live where you do. What a wonderful location for wildlife. I love exploring and your photos came out so well. I think there is a difference in quality with the cameras but I was fooled by the first one. I thought it was the DSLR too. The colours are richly green. This is cute to see nature so close and the caring couple feeding there little ones. I picked the second shot and the duck as the DSLR shots. But I like the turtle the best. oh your pictures are soo lovely! you are lucky to live close to this beautiful place. What a beautiful place. That is so exciting that you got to see mama on the nest and then the little ones. Since I've already read the comments and your answers Diane I don't have to guess. All are great shots. i'd say mum on the nest and the lone duck look slightly better than the others but i wouldn't like to say which camera took what photo. i'm sure i'd be wrong. the lake looks lovely. i wish i had somewhere special like this to walk to. Those first two scenes are idyllic! I'd have to be sure the lake was at the end of my walk so I could spend a lot of time taking pictures. I was sure the second shot and the duck were taken with a DSLR but the first one was iffy. The turtle shot surprises me. The clarity would suggest a DSLR as well. Great job! Nothing better in birding than watching for and then seeing the babies. Wonderful to live near enough to watch the daily changes in birds and plants..